Well, here we are once again. If you’ve been following along with me the past year, you’ll know that I’ve now returned to the place where this blog was born. My first post was in celebration of our youngest daughter’s 3rd birthday. And now, one year later, we’re blowing up balloons for birthday #4. 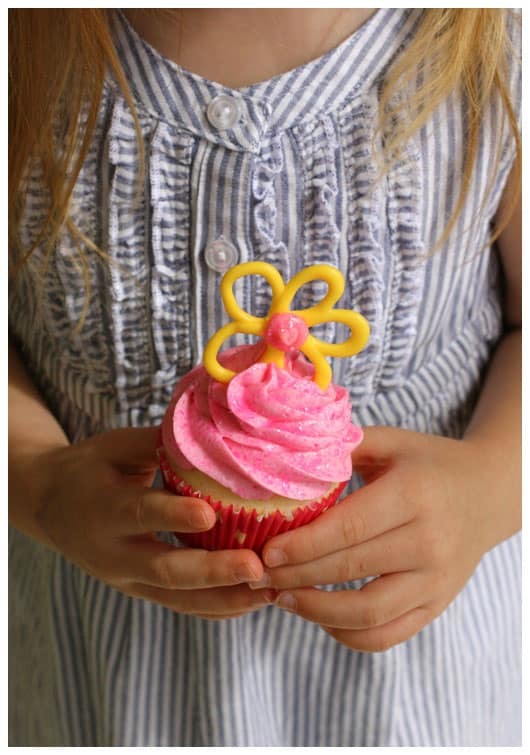 When I made those butterfly cupcakes a year ago, I had so much fun creating the butterflies with candy melts, and vowed to try my hand at it again. 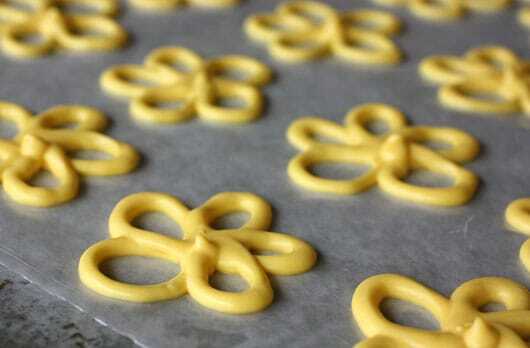 This year, I squeezed a field of yellow flowers out of my pastry bag. They were a much quicker project than the butterflies! There are definite similarities in this year’s and last year’s cupcakes. 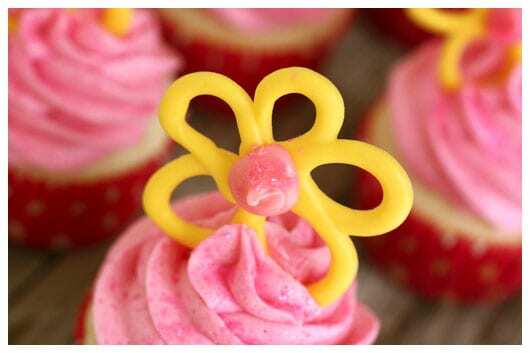 They both have a mound of pink frosting, plus an adornment of candy melt design in yellow and pink. But what can I say? It’s just what comes to mind when I think of Tessa. She’s a girly-girl, through and through. And her favorite color is still yellow, with pink following closely behind. The cupcake base is made from my family’s new favorite white cake recipe, courtesy of Amanda from i am baker. (My family’s old favorite was from a box, as I could never find a white cake recipe I liked!) This cake is moist, fragrant, and absolutely delightful, with a touch of almond flavoring. And my girls adore it. They actually prefer eating the cupcakes without frosting. Yes, this recipe is that good! Happy 4th Birthday, sweet Tessa! Prepare two regular cupcake pans by lining with paper liners. Set aside. In a medium bowl, sift together the flour, super fine sugar, baking powder, and salt. In the bowl of a stand mixer, cream the butter until light and fluffy. Add the egg whites, one at a time, until mixed. Add milk, vanilla, and almond extract. A bit at a time, add the sifted dry ingredients, until just mixed. Fill cupcake cups 2/3 full with batter. I found that mine turned out just the way I like them when I made 23 cupcakes. Bake for 18 to 20 minutes, or until a toothpick inserted into the center comes out clean. Just be careful to not over bake, to preserve that delicious moistness. Remove to a rack to cool completely. With a mixer, cream the butter on medium high until light and fluffy. This should take just a couple minutes. Add the cream cheese and beat again for another minute. Add in the strained jam (I just pressed my jam through a fine strainer) and mix to incorporate. Then add the powdered sugar, 1 cup at a time, until smooth and creamy. Add pink icing color, just a bit at a time, until you reach your desired pinkness. 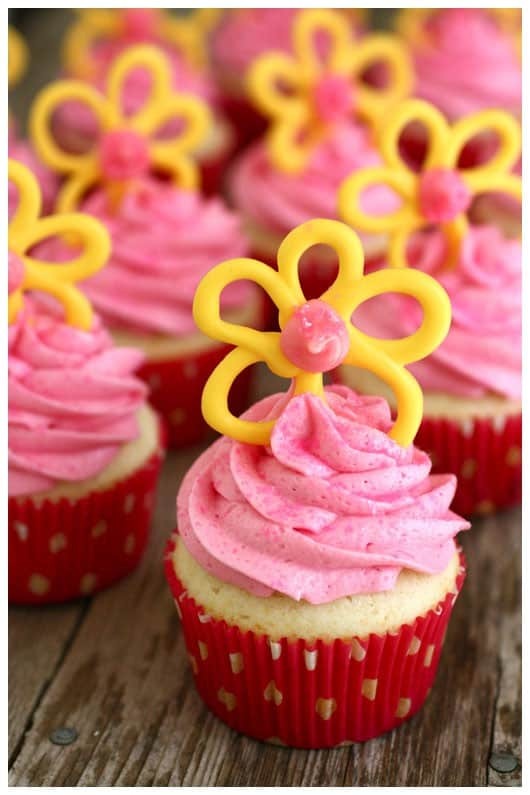 Using a medium size star tip, pipe the frosting onto the cupcakes, then sprinkle with the pink sparkle glitter. Cover two large baking sheets with wax paper to design your flowers on. If you want, you can draw a flower template on a piece of paper, so that all your flowers are the same size and shape. Place your template under the wax paper so the template shows through. Carefully melt your yellow candy melts in the microwave until they are very soft. Stir to completely melt. If using white candy melts, tint the candy now with yellow Candy Color. You can use a plastic baggie and snip off a corner, for piping the candy. I used a plastic plain circle decorating tip, inserted in a disposable pastry bag. This still allowed me the flexibility to pop it into the microwave for a bit if I were to be called away during the project (versus using a metal tip that can’t go in the microwave). 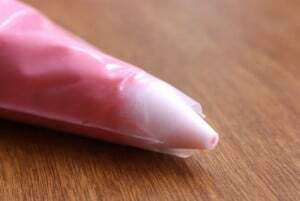 The candy melts will start to firm up and return to a solid state if left to cool too long. 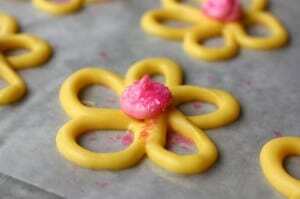 Pipe your candy, following the flower’s lines on your template. Or just freehand it. When you have a full pan of yellow flowers, pop the pan into the fridge to let them firm up for a few minutes. Next, prepare the pink candy melts in the same way you did the yellow. Pipe a circle of pink candy onto the center of your flower. Repeat a few times. Then sprinkle the pink centers with pink sparkle glitter. Don’t wait too long to sprinkle with the glitter, or the pink candy will set up and the glitter will not adhere. Pop them back into the fridge for a final set. Note: these can be made many days in advance. 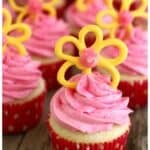 Press Candy Sparkle Flowers into the frosted cupcakes to finish. i am baker‘s Homemade Cake Mix, adapted here with instructions for how I made the cupcakes. For Amanda’s full tutorial on storing this recipe as a cake mix (how cool is that?! ), and for instructions on baking this in round cake pans, please see her original post titled “Homemade Cake Mix”.